Bangladesh Railway New Job Circular 2017. 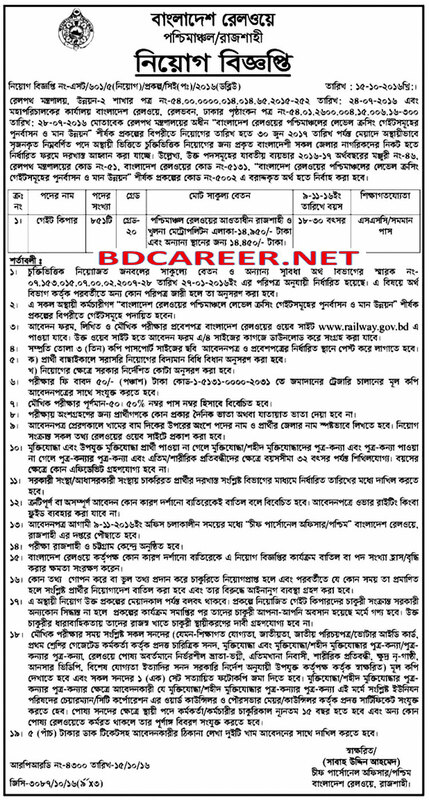 Bangladesh Railway a prominent government organization in Bangladesh will recruit various vacancies for the post of Assistant Station Master. To know more details you are requested to see the original job circular attached below. Interested and suitable Bangladeshi Citizenship applicants are invited to apply for the vacant posts after fulfilling the circularized conditions and instructions. Deadline for submitting Application is 28 September 2017. Apply with a particular Form download from Bangladesh Railway website www.railway.gov.bd Attached with 3 copies of recent passport size photograph after fulfilling the circularized conditions and instructions, will be sent to Chief personnel Officer-West, Bangladesh Railway, Rajshahi.